This is a Newport 401 High-Performance X/Y Translation Stage with a solid top and it is Newport's current model. 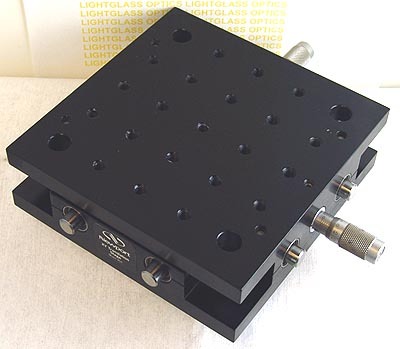 Equipped with multiple drilled and tapped holes on one inch centers for mounting components on, and offering 0.50" movement in the X and Y direction, this stage offers a low-profile and high load capacity. This stage utilizes linear ball bushings and precision ground shafts for its movements and the Newport SM-13 Micrometers are included in the price.